Probate Personal Representatives + Stress = Bad Decisions. Avoid That Equation! | Probate Realtor Service - Alternative Option to Lawyer or Attorney Probate Personal Representatives + Stress = Bad Decisions. Avoid That Equation! Probate Personal Representatives + Stress = Bad Decisions. Avoid That Equation! Stress causes people to do some very irrational things. We have many examples of this but the most recent example is what I’d like to share with you now. A group of siblings (4) lost their father only a year after losing their mother. He owned a lovely home in the Riggs Park area of Washington, DC. His children wanted to keep the property, but didn’t know how to manage that process as there was a reverse mortgage on the house. The family contacted an attorney that didn’t specialize in probate matters. They were told that they would be personally responsible for the debts of the estate if they went through probate! Of course, this was a shock to them and not knowing any better they decided to let the property go into foreclosure. Unfortunately, this happens frequently, but it is preventable. Below is an article from an attorney that specializes in probate issues. She explains briefly the limits of debt collecting. The last thing anyone wants after the death of a family member is calls from debt collectors dunning the loved one’s estate. While some family members can be contacted by debt collectors, the family is protected from abusive, unfair, or deceptive practices. Usually the estate is responsible for paying any debts the deceased may have left. If the estate does not have enough money, the debts will go unpaid. A debt collector may not turn to relatives to try to collect payment (unless they were co-signers or guarantors of the debt). However, the spouse of the decedent may have responsibility for any debts that were jointly held. Debt collectors are allowed to contact the personal representative (executor) of the estate, the decedent’s spouse, or the decedent’s parents (if the decedent was a minor) to discuss the debts. They may not discuss the debts with anyone else. The only reason debt collectors may contact other relatives or friends is to get the name of the personal representative or spouse. But they cannot say anything about the decedent’s debt to those individuals or even say that they are debt collectors. When speaking with family members, debt collectors may not mislead the family into believing that the family members are responsible for the deceased person’s debts. They also can’t use abusive or offensive language. Even if you are the person who is responsible for paying the estate’s debts, you can request that a debt collector stop contacting you. To do this, you need to send a letter to the debt collector asking the collector not to contact you again. You should keep a copy of the letter for your records and send the letter “certified” with a return receipt. Once the collector receives the letter, the collector can contact you only to tell you that there will be no further contact or to inform you of a lawsuit. Remember, the estate is still responsible for paying its debts to the extent that it can. If you have a problem with a debt collector, contact your state attorney general’s office or the Federal Trade Commission at ftccomplaintassistant.gov. 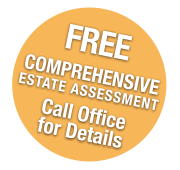 For more information concerning Probate & Real Estate, please feel free to get in touch.